Cheviot Keith Knox Rally 2014. 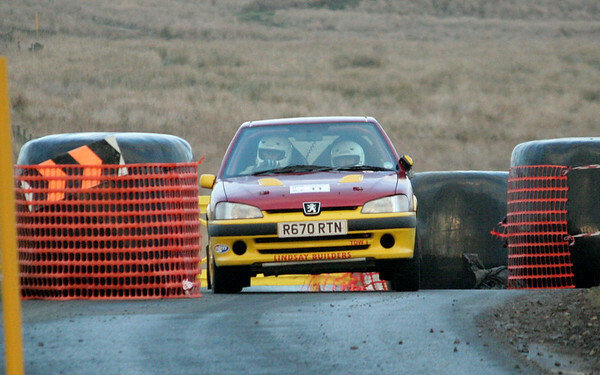 The second rally on the Otterburn ranges was the Cheviot rally on 9th November. The event was the final round of the AS Performance North of England championship and a round of the SG Petch ANECCC championship also. We went to the event knowing we needed points for both championships and really needed the current leader of the north of England championship to hit trouble. It was cold and damp when the sun dawned over the hill. It wasn’t going to dry very quick so I thought wets on the back and cut soft slicks on the front was the best choice. A short road section to the first stage I started to have doubts. There was still water spraying up from the car in front… Into the stage, the grip was good on the majority but a lot of mud was being dragged onto the roads with crews in front doing silly cuts on only slight corners. A short road section, then into SS2 with Barry Armstrong as stage commander. A better time on this one, it uses parts of the range not used very often and has a narrow bumpy road to finish. Back to service we had almost a 2 min class lead. Stages 3 & 4 were a repeat now slightly dryer in places. Positions stayed much similar for the rest of the day, a brake disc change to stop a vibration being the only problem. Reaching the finish in 15th O/A and winning the class by 6min. Which got us good SG Petch points but not enough for myself to win the AS Performance. It was enough for Michael though he is North of England champion due to drivers & navigators swapping and getting different points.